Check out this Free Goodies page featuring some great free resources you can use in your homeschool. They change these free resources from time to time, so be sure to check back often to see what's new! -- What about socialization? We have all heard that one before, haven't we? And, we've got some good answers. But have we always answered it the right way? -- This free downloadable resource features four full-length books and thirty-eight short stories, all reprinted from some of the best family-friendly, character-building literature from the mid to late 1800's. -- Everything you need to know to get your kids - or your family - started in business for themselves! Businessman Russ McGuire shares lessons and insights from his own experience that are sure to jumpstart any budding entrepreneur! 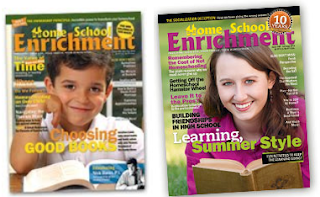 In print since 2003, Home School Enrichment Magazine provides the encouragement, practical teaching ideas, spiritual insights, and much more that you need to keep homeschooling joyfully and successfully. Check out their issue listings for more information, or read online for free!